Since she was six, Jennifer Fratesi loved the water. The 26-year-old started swimming in her native Sault Ste. Marie when she was a little girl and soon she was showing her potential, shattering club records, and beating experienced swimmers. And talent she did have. Fratesi would go on to participate in the 2004 Games. 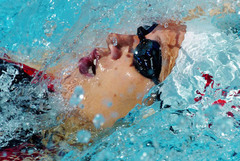 She came in ninth in the 200 metre backstroke semifinals in Athens. Fratesi was just two-hundredths of a second – a blink of an eye – away from earning a place in the final race. “I was very close,’’ she said. Just before the Olympics, Fratesi was the fastest female 200 metre backstroker in the country holding the record of 2:11:16. Fratesi came to ROW when she was 15 to train in a 50 metre pool and under the direction of Dean Boles. She set a Canadian record in the 200 metre backstroke at the 2001 world championships in Japan, a feat that led Swimming Canada to crown her female athlete of the year. For Fratesi, swimming was her life, putting university studies on hold. She trained six days a week, at least four hours a day, training on dry land as well. “I had a really good time and I have a lot of respect for the club. It was my second home,’’ she said. After the 2004 Games Fratesi focused on her studies and retired from swimming. She is currently a medical student at the University of Ottawa where she hopes to become a radiologist maintaining the tradition of medicine in the family. Her mother is a nurse, her father a surgeon and her older sister is a dermatologist. 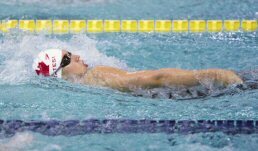 For swimmers at ROW, Fratesi says it’s the journey that matters not just the end result. “It’s the friends you meet,’’ she said. But the feeling of being in water, well there’s nothing like it, she says. “Water is soothing. It’s therapeutic. It feels like home,’’ said Fratesi, who’s active in other activities such as cross-country skiing, rollerblading, kayaking and 6:15 a.m. runs.